For only six weekends of the year, enjoy a rare and special opportunity to enter the enchanting Muogamarra Nature Reserve – a highly protected and incredible area bursting with natural treasures at every twist and turn. Visit between 12th August and 17th September to experience this amazing place transform into an incredible array of colours as the spring wildflowers come into bloom, and enjoy the stunning views overlooking the tranquil Hawkesbury River. Muogamarra Nature Reserve is only an hour north of Sydney and getting there is easy – head north towards Newcastle and take the Berowra exit off the Freeway. Turn right onto the Pacific Highway, follow it past Cowan, and you’ll see the park entrance on your left (don’t forget $15pp cash to enter). Upon arriving you’ll be greeted by a team of passionate volunteers who will tell you everything you need to know about the area, so you don’t have to worry about planning your trip too much. There are plenty of walking routes to try – we went for the Deerubbin Lookout route first, followed by the Point Loop track to finish. The Deerubbin Lookout track is 4.5km and won’t take you much longer than 1hr 45 mins. The route will start with a beautiful view over Brooklyn, before taking you down a historic road, rich with Aboriginal culture and varied landscapes. After winding your way through this route you’ll reach a short climb up onto a rocky platform above the Hawkesbury River with some well deserved sights. Climb a bit further up and you’ll reach the final destination of the route – Deerubbin Lookout – with outstanding panoramic views making every step totally worth it. By the time we finished this route, we had time for one more, so we picked the Point Loop track – a 2km flat route which can be done relatively quickly. This is one we’d highly recommend, not only for the wildflowers which colourfully line the route all the way around, but mainly for the unbeatable views at Western Lookout point, located about halfway around the loop. 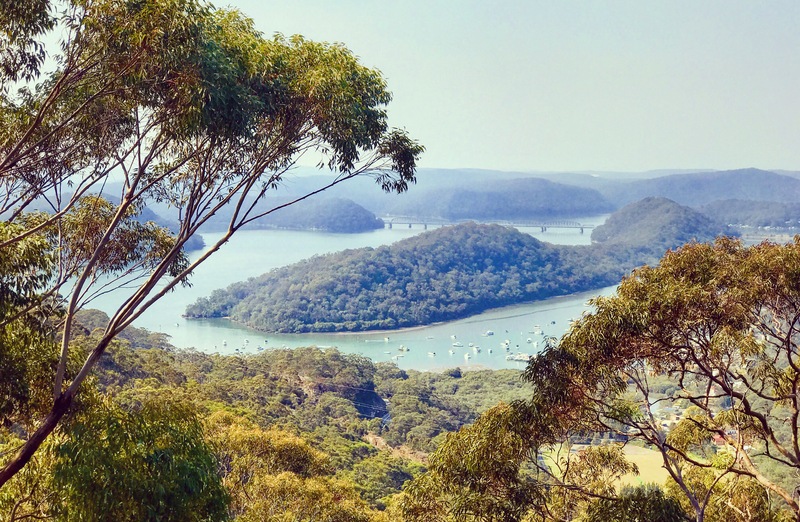 The Lookout includes a vast area of natural rock, inviting you to take a seat and enjoy the totally open and un-interrupted views over Peats Crater, Bar Island, Berowra Creek and the Hawkesbury River – really quite spectacular and has to be the best view we’ve seen yet on a hike. It will take something extraordinary to beat this. Make your way around to the left and yet another incredible view will be awaiting, with a perfectly placed rock jutting out to take some time out and reflect on this stunning landscape. Muogamarra Nature Reserve really is Mother Nature at her very best. If you have the chance to visit this Spring don’t think twice, you won’t regret it for a second and if you’re anything like us, you’ll be counting yourself extremely lucky to have experienced the natural wonders of this extraordinary and very special place. This looks incredible and feels even more special as it’s only open for such a short time in the year. Adding to the list!